Vinyl floor tiles and coverings; 'Galbestos' sheeting. Asbestos has been known to have been found within over 3200 different types of construction and building products. It is an extremely versatile material that can be added to a variety of construction materials. Photos of common Asbestos materials in the Middle East can be found at the bottom of the page. How do I know if Asbestos is in my building or site? Asbestos can only be definitively detected by laboratory analysis. If you suspect that Asbestos may be present within your property or site, you can contact us to safely collect a sample of the suspected Asbestos Containing Material (ACM) and analyze the material for Asbestos content. If you have concerns about multiple areas, then you may consider a full Asbestos survey of the site (Management Asbestos survey / Pre-refurbishment-demolition Asbestos survey). What should I do if Asbestos is found in my building or site? Asbestos materials that are in a good condition are not dangerous provided that they are not disturbed. If ACMs are in a poor condition or if maintenance/refurbishment or demolition will damage or disturb the Asbestos, then we can remove these materials for you. We are registered with the local regulatory authorities throughout the Middle East. Can Asbestos be found in new buildings? 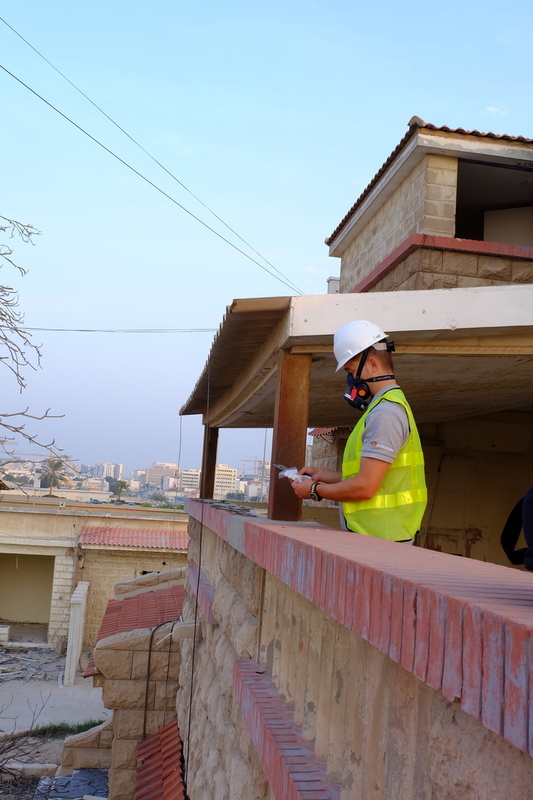 Despite Asbestos bans and prohibitions being in place in the countries listed above, it is not uncommon for Asbestos materials to make their way in to the Middle East, and on to new construction sites and buildings. This is typically a result of poor Asbestos awareness, unfamiliarity with Asbestos Containing Material’s (ACMs) and the influx of counterfeit building materials branded as ‘non-Asbestos’ imported from parts of Asia. What should I do if I have damaged or disturbed an Asbestos Containing Material (ACM)? If you suspect that you have damaged or disturbed an ACM it is very important to ensure that further spread or exposure to the Asbestos material is minimized. Access to the area should be restricted immediately through the placing of signage, warning tape and locking the area where possible. If an individual’s clothes have been compromised then these should be carefully removed and turned inside out whilst being removed (to ensure fibres remain on the inside of the clothes), and carefully placed within a plastic bag and sealed using duct tape. The individual should then clean their hands and face (and any other areas of exposed skin) with wet wipes (which should be kept with the bagged clothes), before showering thoroughly where possible. Advice should then be sought directly from us at this stage to determine what further testing and Asbestos abatement may be necessary. What should I do if I want to undertake refurbishment in/on my house/office/AC system? Prior to any refurbishment works it is imperative that a pre-refurbishment Asbestos survey is undertaken by a competent, trained and experienced individual to ensure you do not damage or disturb unknown or hidden ACMs that could be present. We have such staff worldwide to support these matter's so please do not put yourself or your employee's at risk if you need help in this area. I live in a rented property - Are the facilities management team and building owners aware of Asbestos in the building? In parts of the United Arab Emirates it is a legal requirement for building owners to have a plan to manage Asbestos risk within their properties. An Asbestos survey and management plan is a mandatory requirement to ensure buildings residents, maintenance personnel and members of the public are not exposed to Asbestos. If you are unsure, ask whether an Asbestos survey of the building has been carried out. The air conditioning, plant and other equipment in my building is very old - Could it contain Asbestos? Asbestos has been known to be found within AC duct insulation, gaskets and internal linings to the ventilation ducting. The only way to know whether it contains Asbestos is for inspection, sampling and analysis to be undertaken. Can Asbestos fibres spread easily? Asbestos particles can become airborne easily through maintenance and refurbishment works. If you have concerns regarding possible airborne fibre concentrations (Asbestos/rock wool/Man Made Mineral Fibre (MMMF) within your site contact us for airborne fibre monitoring. Is Asbestos dangerous if it is not damaged or disturbed? Asbestos materials that are in a good condition, are sealed and/or enclosed are not dangerous provided that they are not disturbed. If ACMs are in a poor condition, are unsealed or not enclosed, or if maintenance/refurbishment or demolition will damage or disturb the Asbestos, then these materials should be removed very carefully by our trained professional's. For more details on Asbestos Management Services.